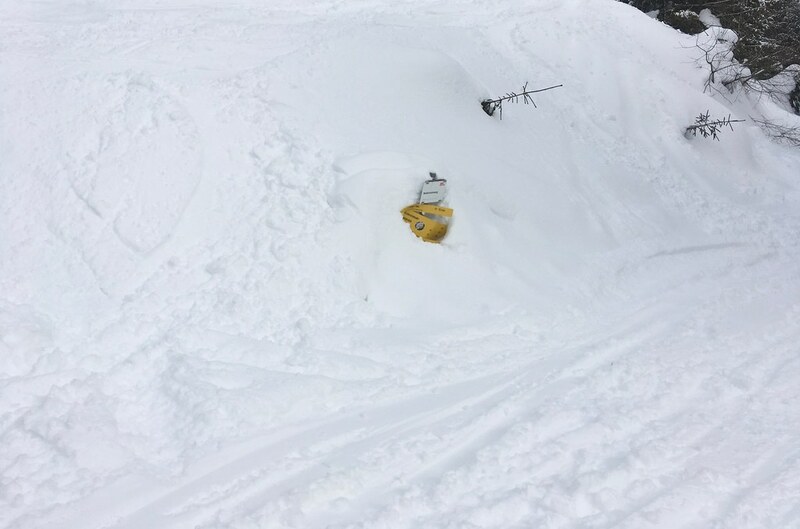 There was mini avalanche in Soelden town centre yesterday. Off the hillside behind the BP station and onto the road that goes up to Innerwald. Extremely impressive emergency response - within 5 mins of the sirens going off there were fire engines, ambulances, police and rescue vehicles on the scene. I don't think it's a place pedestrians would be but it could have buried a car - hopefully no one was hurt. @Scamper, I presume a glide avalanche, sliding on the grass? Hard/impossible things to control artificially. @clarky999, yes, I could see the grass where it had come from. It snowed a bit overnight. @clarky999, Useful info, thanks. 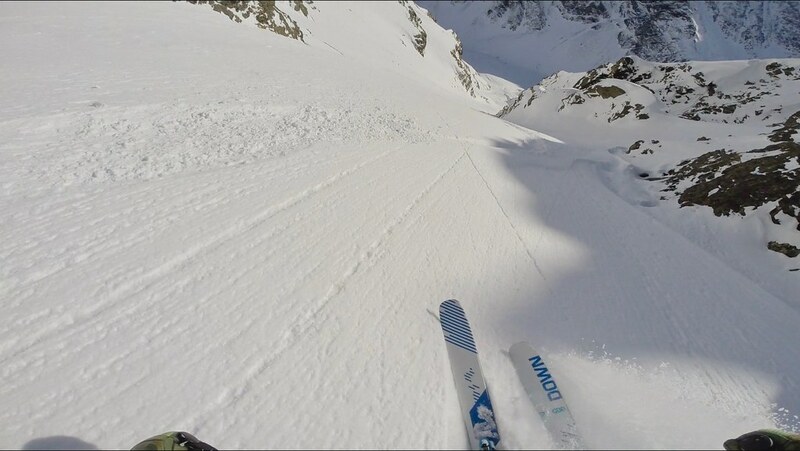 Those photos of Nordkette and Stubai are incredible! 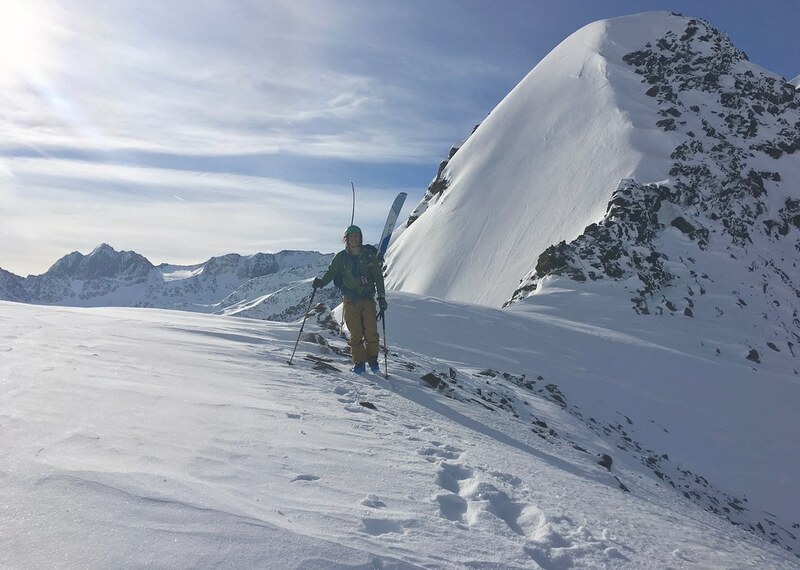 With the snowpack settling and avalanche risk reducing (L2 today), today seemed like a good day to ski something a bit bigger. 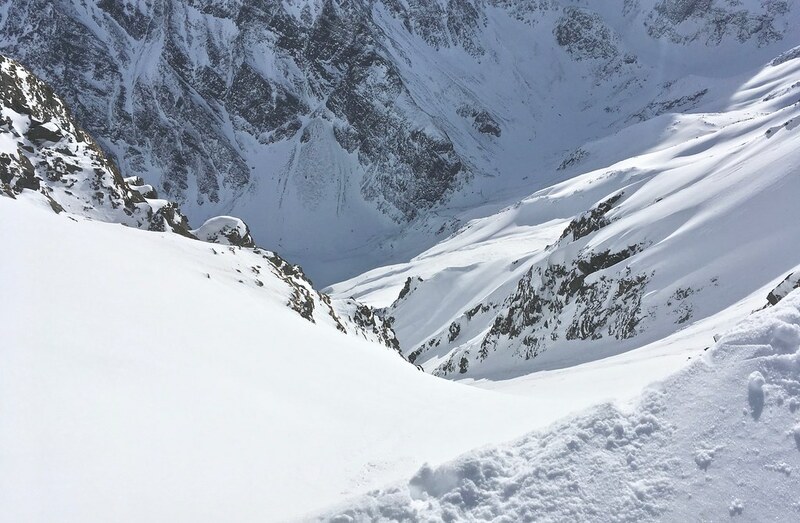 My friend Nico suggested a couloir on the edge of the Kühtai ski area, with only 200 vert metres of ascent needed to access it. As I'm still trying to shrug off a bug of some sort, that sounded like a plan to me! Driving into Kühtai first thing it was clear the wind had been at work - some slopes plastered, others completely blasted with grass and rock poking through. 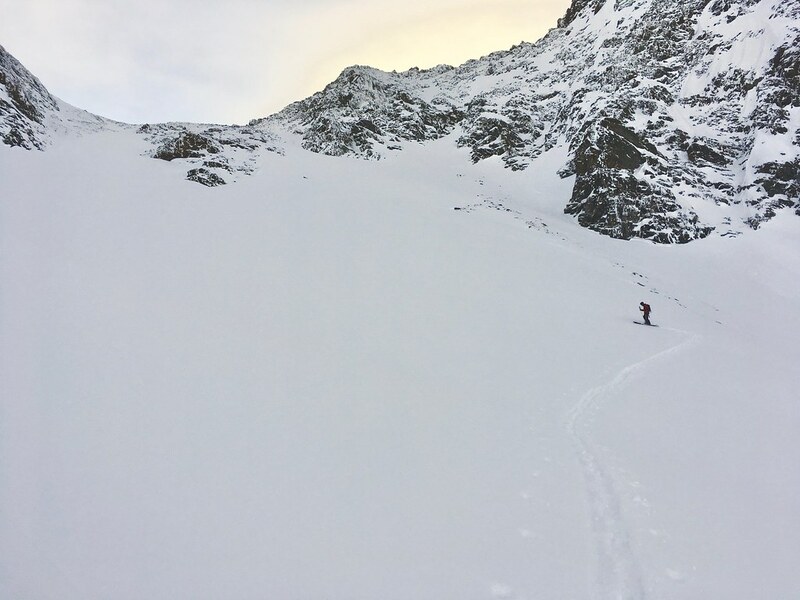 Surprisingly there was still plenty of untracked snow left in the normal ski area too, though most of this had been skied out by the end of the day. In shaded spots it was still pretty fluffy too, and cold, with -10°C in the village. Upon gaining the ridge we got our first view into the couloir - which looked pretty much perfect! 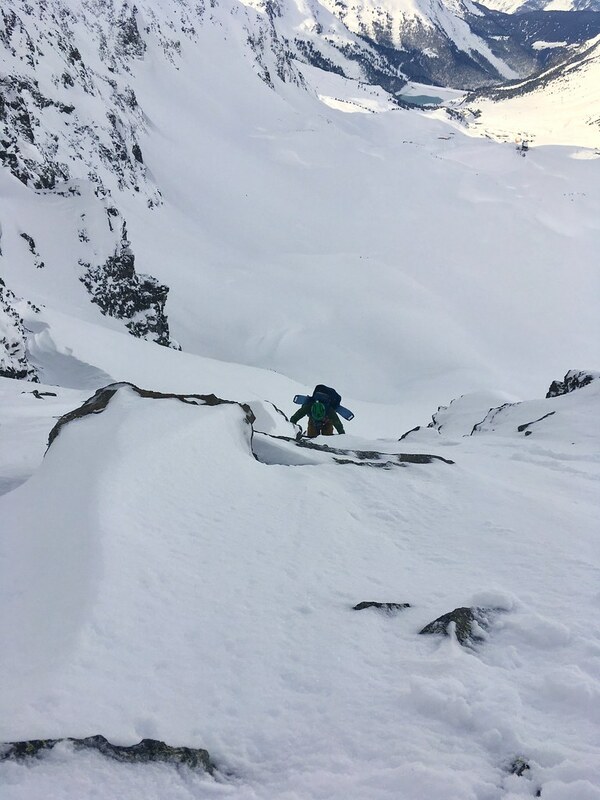 The only bit we were really concerned about was the first, dropping from the cornice onto a loaded slide slope before moving into the main couloir. In the end it was all good, but we basically straight-lined across it for safety's sake, traversing straight across the slope under the rock band. After that it was just a straight 800 vertical metres down to the valley floor below, with no tracks but our own! 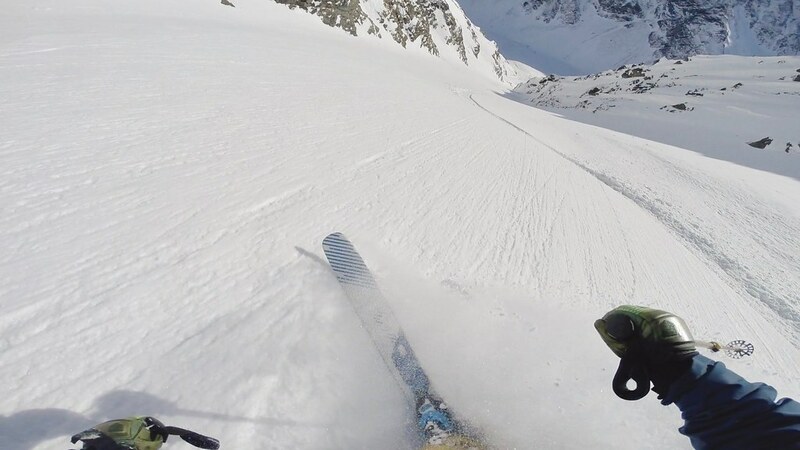 Snow was generally great - fluffy powder on the right, and some sun crust in places on the left. Old buried avi debris in a few places demanded some attention, rather than completely letting loose. We re-grouped again near the bottom, to plan the way out to the valley. The avi debris became a bit more problematic here! After working down through the side valley to the main Selltraintal we caught the bus back up to Kühtai or a few resort laps, then scored some more snowing dropping off the back of the other side of the resort towards the reservoir. After the hike back lunch was calling, and after a couple of radlers we decided to just chill for the rest of the day. 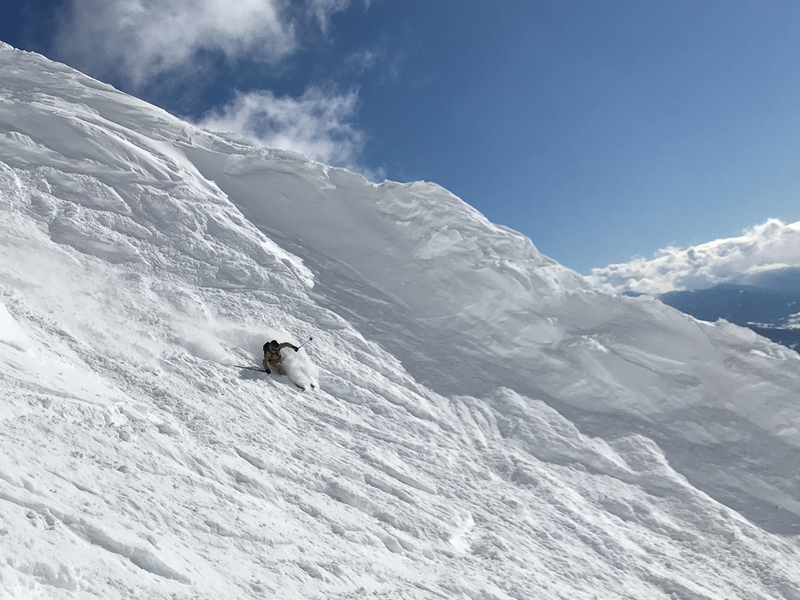 All in all, great snow, just the right amount of adventure, and fun to get into a bigger line for the first time this season! @Benji!, looks as if no lockers at Jenbach but there are at Wörgl. https://www.oebb.at/en/reiseplanung-services/am-bahnhof/gepaeckaufbewahrung.html The train to Kitzbühel leaves from Wörgl anyway. Nordkette opens(ed) today btw. They definitely had a lot of digging to do! @clarky999, And what time was it necessary to join the queue this morning to get a look in? I'm not sure I'm up to being trampled in that bunfight yet! @Scarlet, probably about 7 haha! I doubt the snow is that good up there now anyway though. Lots of it obviously, but it's been cooking in the sun for a while now. So we're arriving at Innsbruck early Sunday morning and the plan is to check out one of the local areas before heading onto St Anton. Originally we thought the Glacier would be nice but some weather has now popped up in the forecasts. Would Schlick make the best alternative? Anywhere else we should consider? 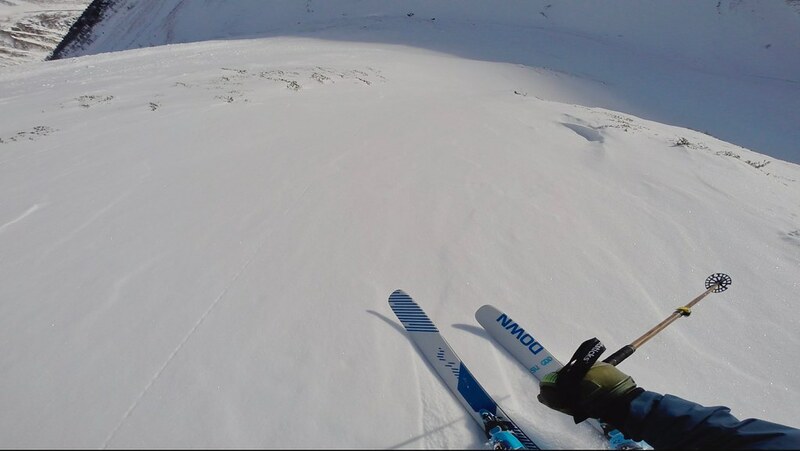 @Snow Hound, I had a great day at Axamer Lizum in Saturday. 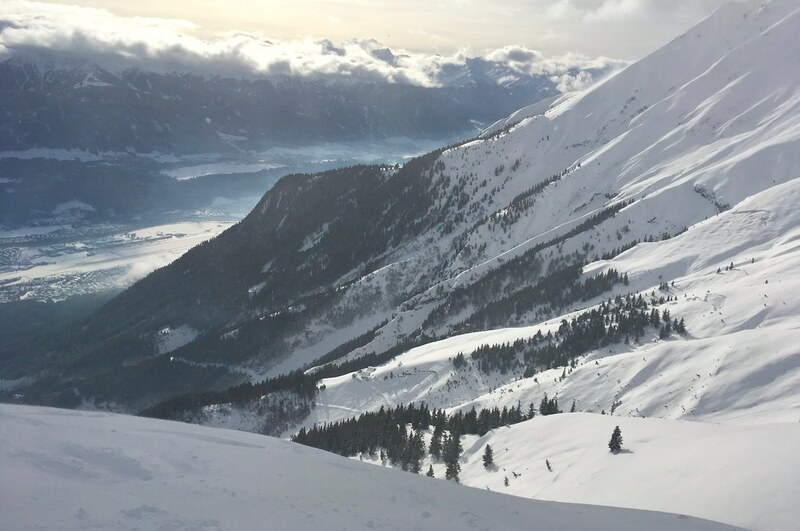 Had been tempted to scoot out somewhere in austria to do some off piste now avalanche risk was down - am I to take it from above reports that in effect the powder has degraded? My business model heretofore has been to be there during or the day after a dump but was wondering should I expand that to a few days after to allow avi risk to settle down? Is it just that temps got warm for a bit or exposure to sun? But really it depends on what sort of skiing you're looking for? Nordkette is completely south-facing, so you have to be there as it's snowing or the first day after if you want pure un-transformed powder. 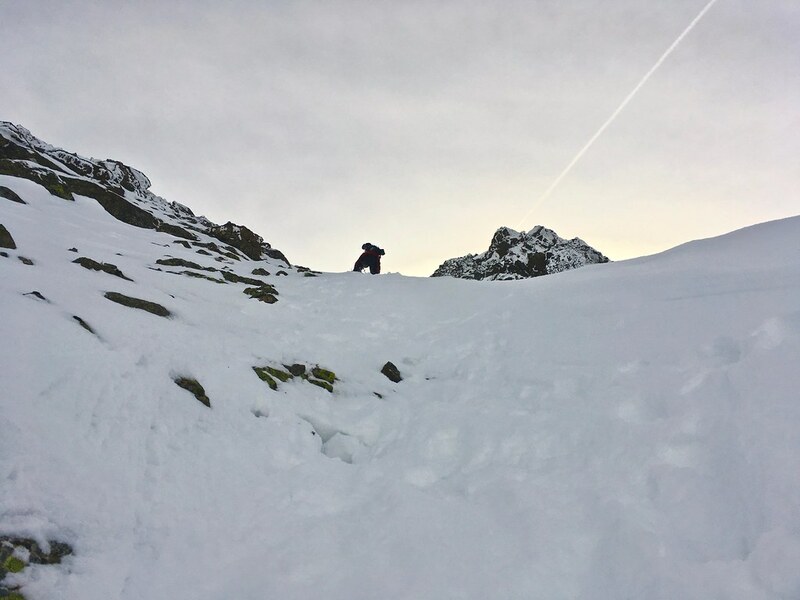 There's still proper powder to be found in shaded and protected aspects - but now a week after the snowfall, you'll have to work to get it (ie hiking). 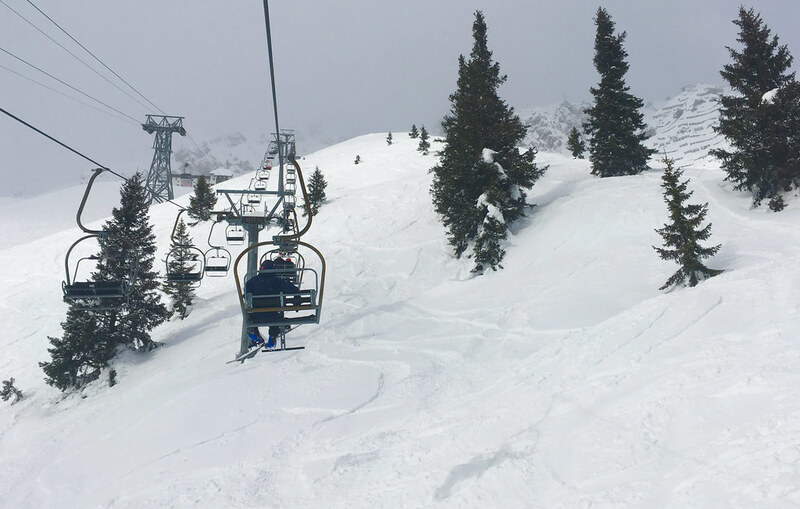 IME these days there are very few resorts where you'll be able to find proper untracked powder straight from the lifts more than two days after a storm. 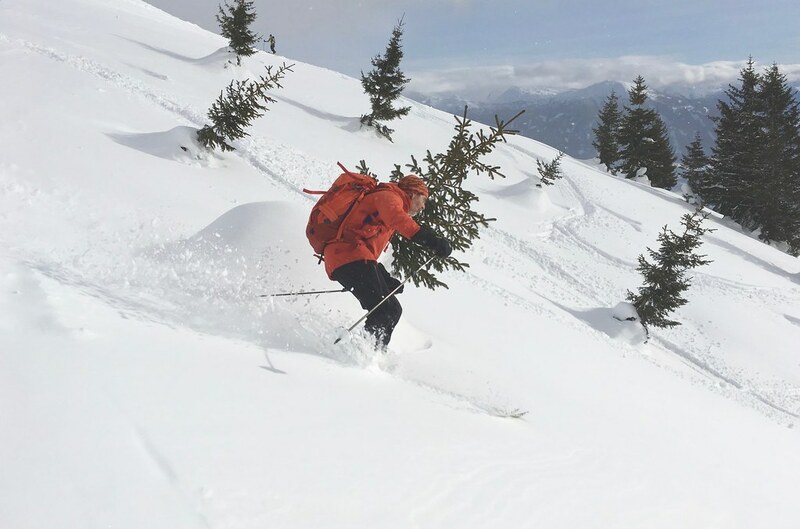 And those that you can, you will either probably not have heard of, or need local knowledge to find the stashes, or be prepared to step up to more commiting lines than most of the powder chasing hordes. 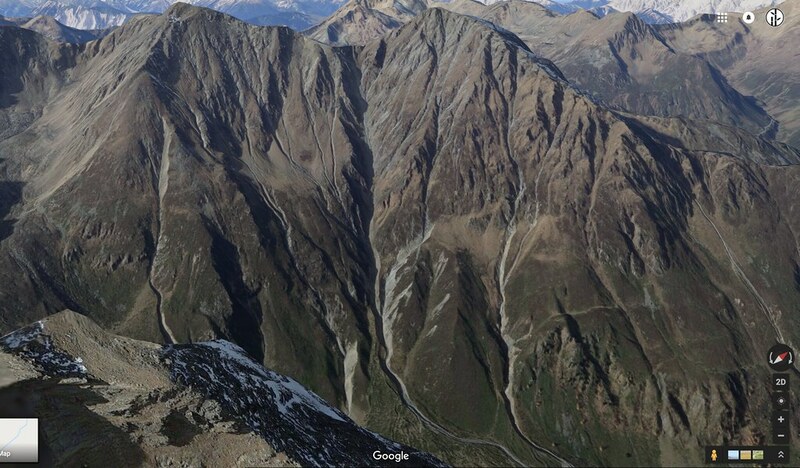 Schlick is my favourite ski area close to Innsbruck. 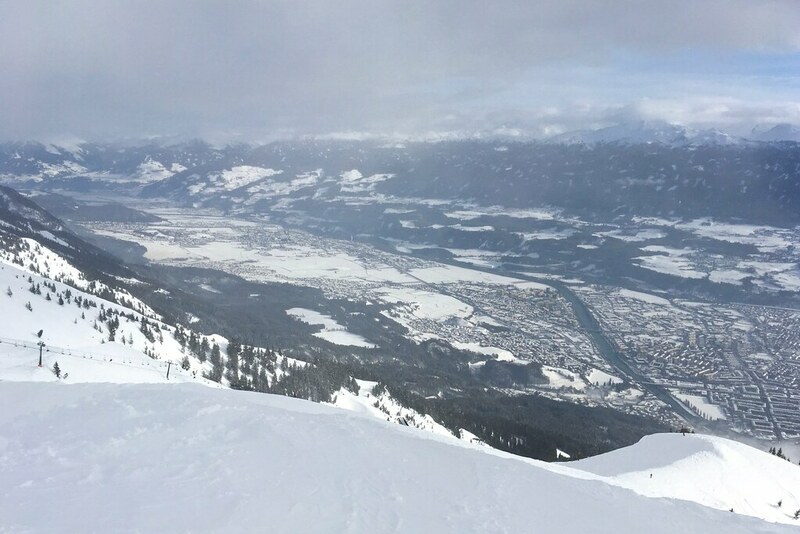 There aren't a lot of difficult runs (one fairly challenging 'ski route') but the scenery is wonderful, it never seems to get that busy, and the bar at the bottom of the gondola is always fun and lively after a day on the slopes. Usually catch the tram from IBK to Fulpmes, and then it's a 10 minute walk. Not the quickest way there from IBK but easily the most enjoyable. Light snow overnight/this morning, down to the city. Maybe up to 10cm on the mountains I guess, not much more. Should refresh the pistes a bit anyway! Nice one thanks for that. It's everybody's first day of the season so sounds like a perfect warm up. Vomiting white stuff in the city this morning, probably had 3” over night and it’s still going reasonably hard this morning. @Feast, yep! 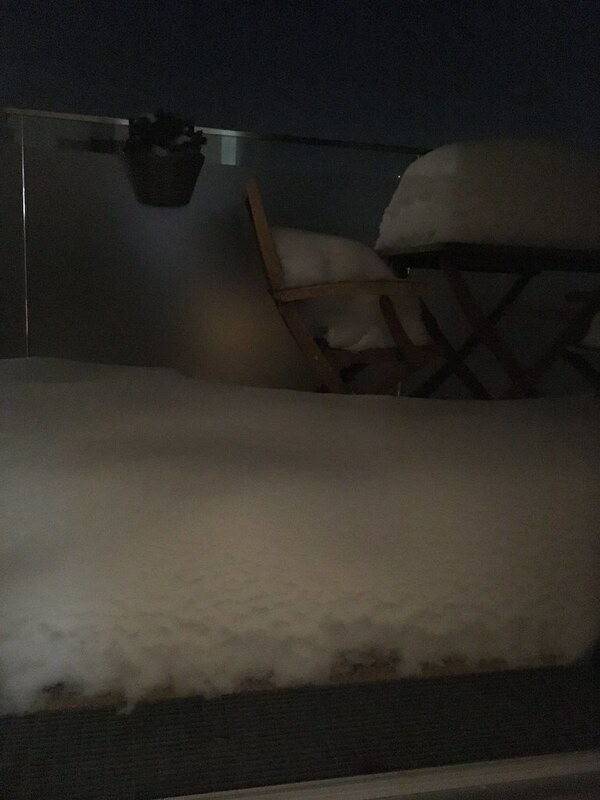 Probably about 10cm fresh on our balcony. Interestingly, exactly as Morris predicted, warmer air has come in higher up but the cold air is stubbornly clinging on in the valleys. So it's actually colder (and maybe snowing harder) in the valley than the mountain. -6°C in the city and -3°C at Seegrube, for example. 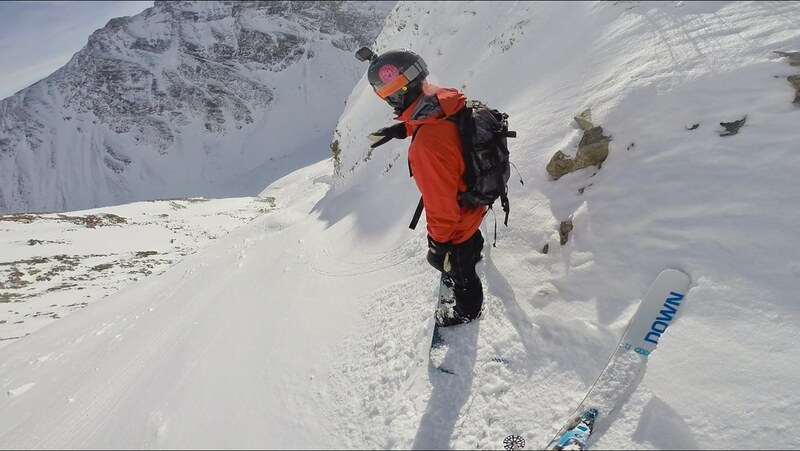 The conditions in Schlick were great this week, not many people and relaxed. If you have a car, it's really easy with alarge free carpark or, underground parking with a lift to the gondola if you want it ultra convenient. 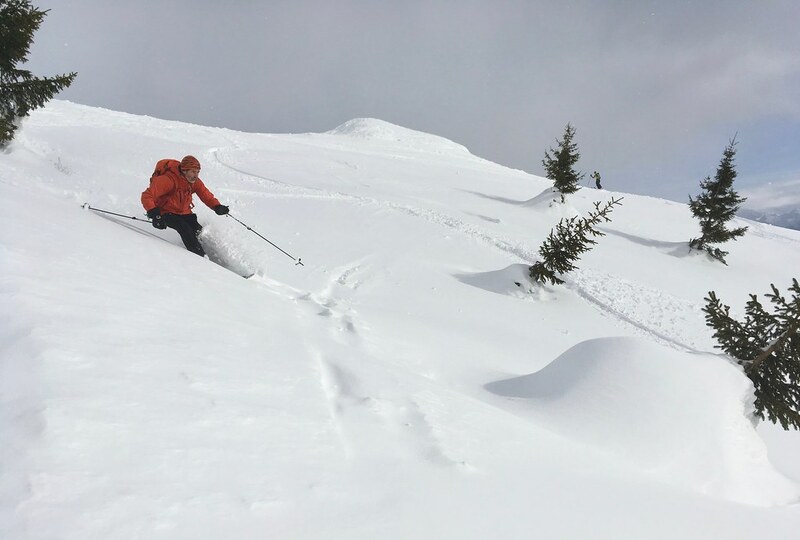 Unexpectedly good skiing today, and a bit of a sleeper pow day! With 4-5cm forecast no-one was really expecting much, so plan was a lazy morning, a few ticks of the to-do list, then an afternoon of bumps at Nordkette to get the legs back into shape after the last few weeks of man flu. Instead we woke up to 10cm of snow on the balcony, and 15cm or so on the car. Still not really expecting much on the hill we didn't head up until 11am or so, but luckily it seemed no-one else did/had either! 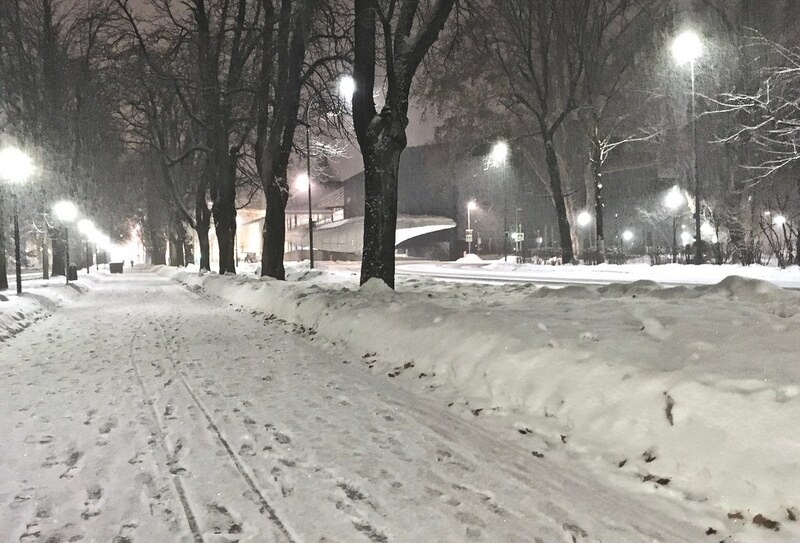 It was actually pretty cold in the city with -6°C, and really dry powdery snow. Nordkette was warmer with -3°C at Seegrube, and the snow definitely did get heavier through the afternoon after the sun came out. 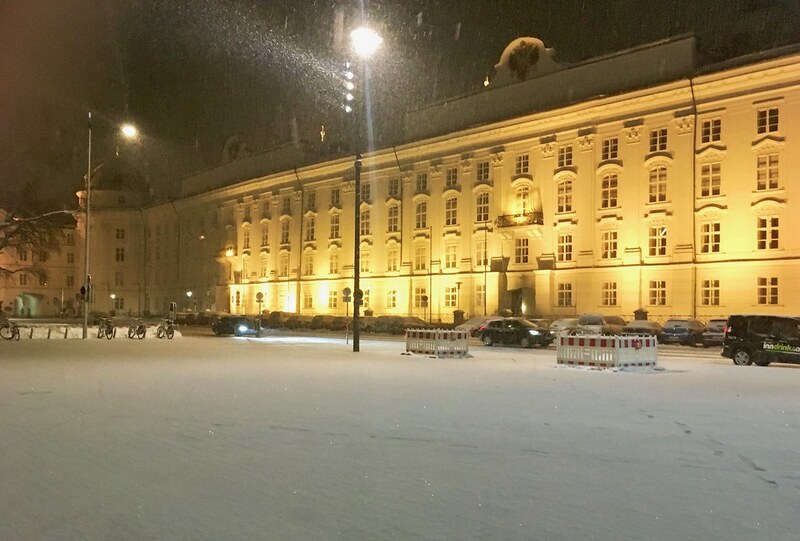 Generally 20-20cms of new snow. 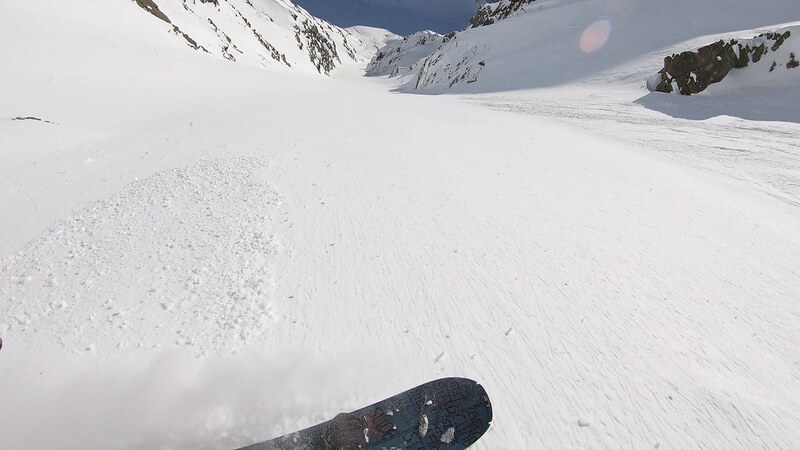 Looked like more higher up, but Hafelekar stayed closed all day (I think the resort/avi commission were taken by surprise by the snowfall too, as I don't think anything got bombed today at all!). Sometimes the snow was on a really hard, manky and bumpy old base... and sometimes was deep and/or smooth enough to not notice. Still, not can't complain when you expect bumps and get fresh snow instead! Piste was fantastic too - clearly groomed before the snow started falling then left au natural. But the whole Inntal is white, right to the valley floor. 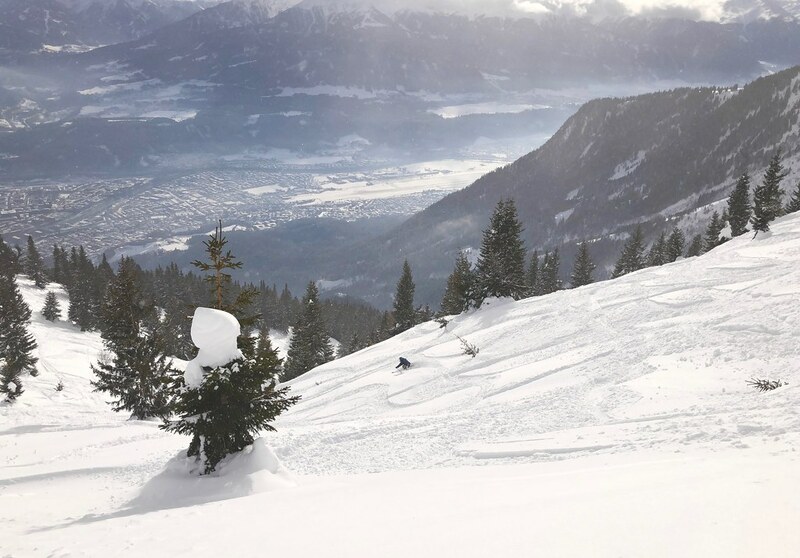 Technically the Nordkette valley runs are closed - I believe due to land issues... No problems at all skiing to the base in terms of snow though, however there are some interesting manoeuvres through/round/under the number of trees that fell over under the weight of snow! Bumped into an old friend at one point. He owns and runs the travel company I won a skitouring trip to Russia (Elbrus) with a few years back. Another ~10cm in the city overnight/into this morning. Woken up by the bombing at Nordkette, which they normally only do with more than 25cm of new snow, though they haven't updated snow heights since yesterday. Pretty cold atm: around 0°C in the city, -8°C at Seegrube, and -11°C at the top of Nordkette; -12°C at the top of Lizum; -10°C at Schlick; -14°C at the top of Stubaier Glacier. Fair bit of snow forecast for the weekend currently too: ~30cm for Nordkette, Lizum, Glungezer, and Schlick 2000; 25cm for Kühtai and Patscherkofel; 70-80cm for Stubai Glacier and Obergurgl. Just arrived back from a week of skiing in the Innsbrück area and Arlberg. 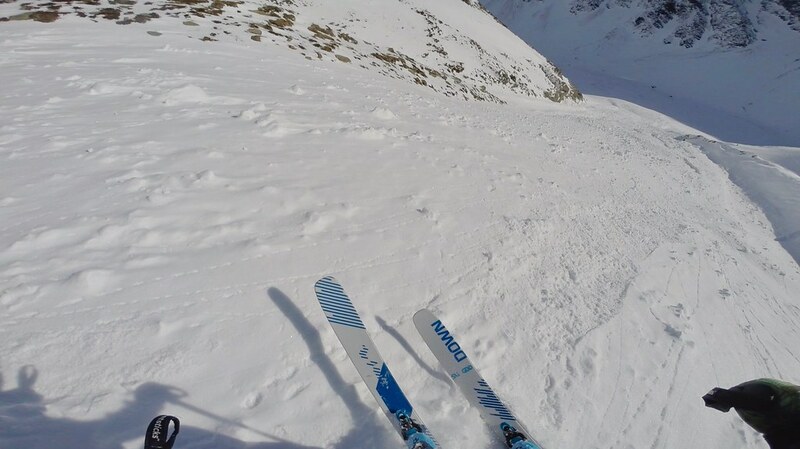 First day, skied in Schlick2000. Great small area and snow was really good. 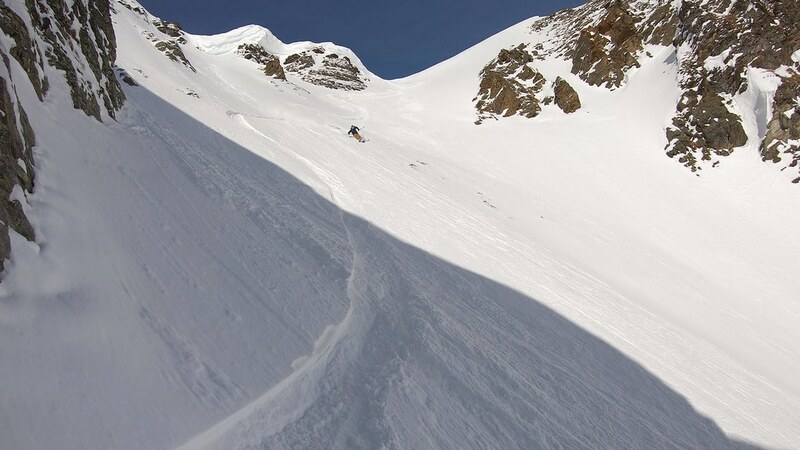 Fun off-piste and could still find some good snow many days after last snow-fall. Second day, Axamer Lizum. Skied there on a Monday and hardly any people there at all. 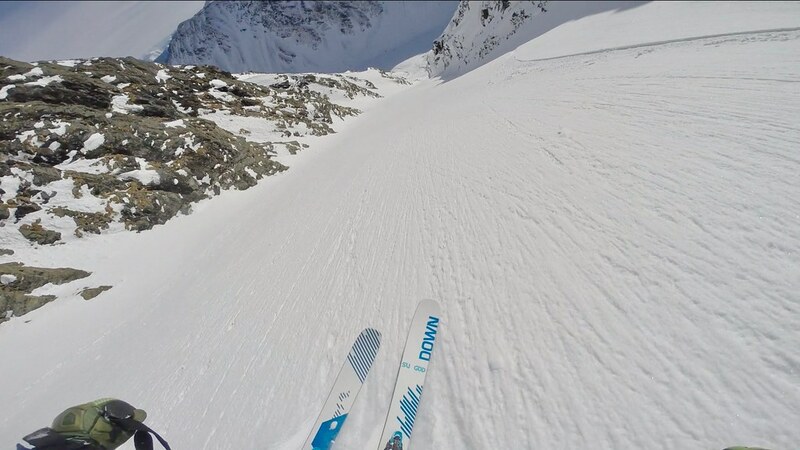 Fun off-piste routes which were easy to spot and close to lifts. 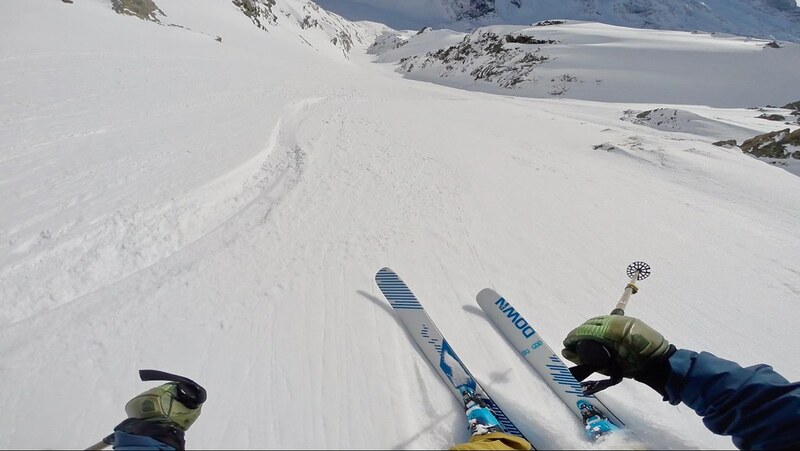 Snow was okei but had been skied more than in Schlick. Third day, Nordkette. Like Clarcky999 had said, south-faced so more icy snow. Still cool to be able to do the different routes from the top and it was not mogulled. Arlberg; had a guided day and did the Valluga north in what felt like Alaskian snow. Awesome conditions. All in all, a lot of fun to ski in the Innsbrück area and happy that they just opened Nordkette the day before we were going to depart Innsbrück. Looks like it is going to be an epic season there with snow long into the spring. Another dusting down to the city last night, but just a few cm this time. Now the sun's coming it, so should be a glorious ski day (for anyone not stuck in the office)! 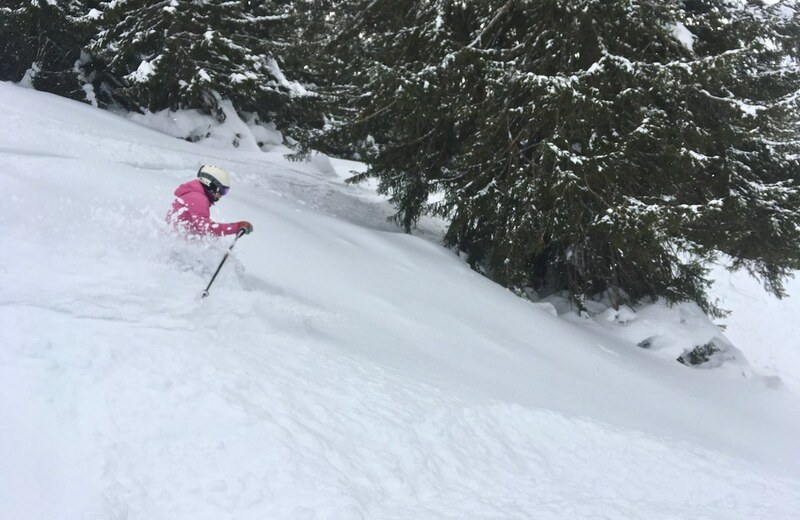 Went over to St Anton today where it had dropped another 30cm of fluffy powder on the mountain up at Rendl. The sun came out mid morning, though it remained rather chilly (-11 at Rendlbahn valley station at about 2.30pm). 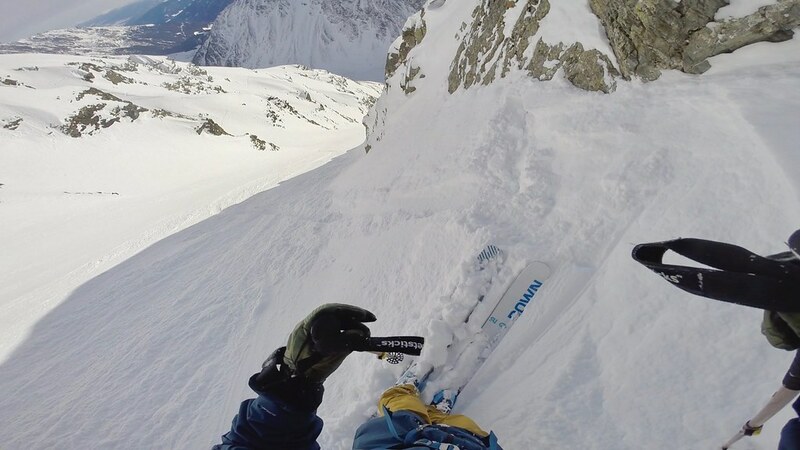 @Scarlet, the Schindler couloirs can be really sick, but yeah, get trashed sooooooo quickly these days. 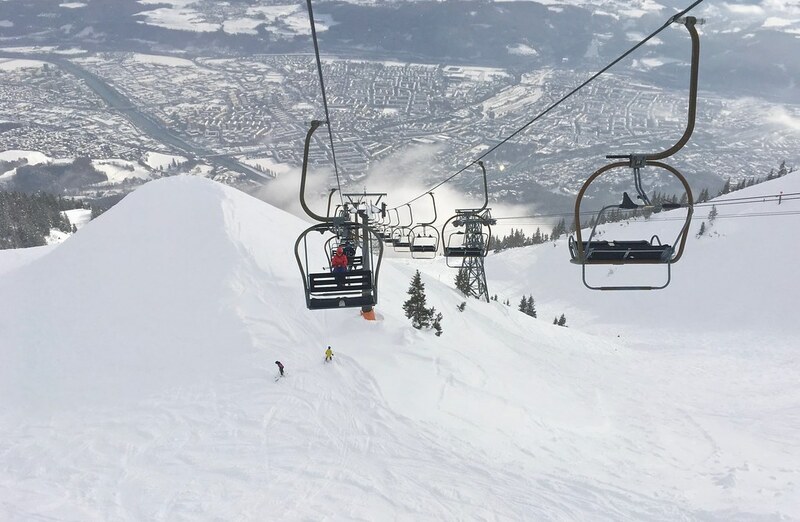 @compostcorner, there's no official piste, but it's very easy to ski there offpiste over the meadows/popular skitouring route/toboggan track from the top of the Birgitzköpfl lift. Heavy snow again as I was walking home from work last night, and another good 10cm+ of snow in the city by this morning. Snow was settling on the roads too, which got quite slippy. Saw one guy in a rear wheel drive BMW try to take a corner way too fast and just slid sideways and sideways and siiiiidewaaaaaays... Then sideways into a lamp post. None of the passengers were hurt, but he had a big pole shaped dent in the side of the car. I wonder do the austrians have a word for schadenfreude? @Scarlet, nice work! By the time I'd clocked it was snowing last night it was too late to arrange the morning off. Looked good up there though, and some really nice stuff on IG from Schlick and elsewhere too. Gonna be a tricky weekend. Snow from the south, Föhn in the north, warm, rain, then snow from the north... Glaciers and eg Obergurgl will get a lot of snow, but won't be able to see anything. Freezing level will be key elsewhere. The hotel I’m in doesn’t have gaste kartes. Will I be able to travel free on bus J in ski gear? Or will I have to buy a ticket? @Oceanic, Free in ski gear, afaik. I took a bus to Kühtai yesterday and was waved through when I tried to buy a ticket. I'm pretty sure it's the same. I'm not sure where you are but I've never ever been asked for either a ski pass or a guedtcard on a bus. Do you mean the Welcome Card? J Bus is free if you're in ski gear and going skiing. 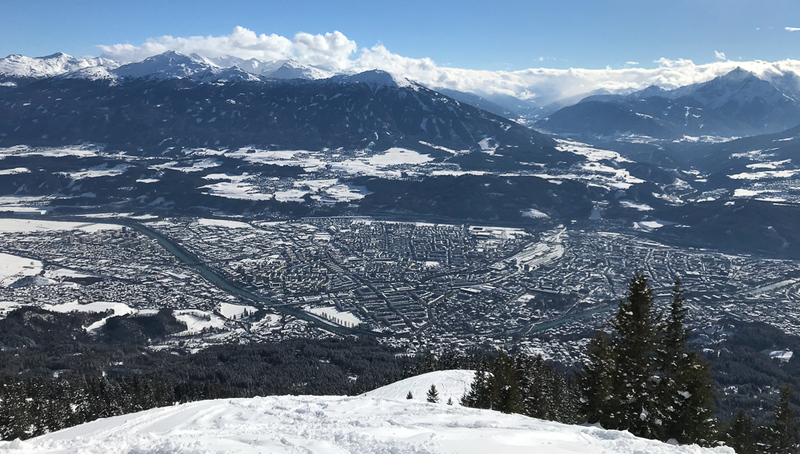 However officially to use the other ski busses (inc the one to Kühtai scarlet mentions) for free you need the Welcome Card or Innsbruck Card. 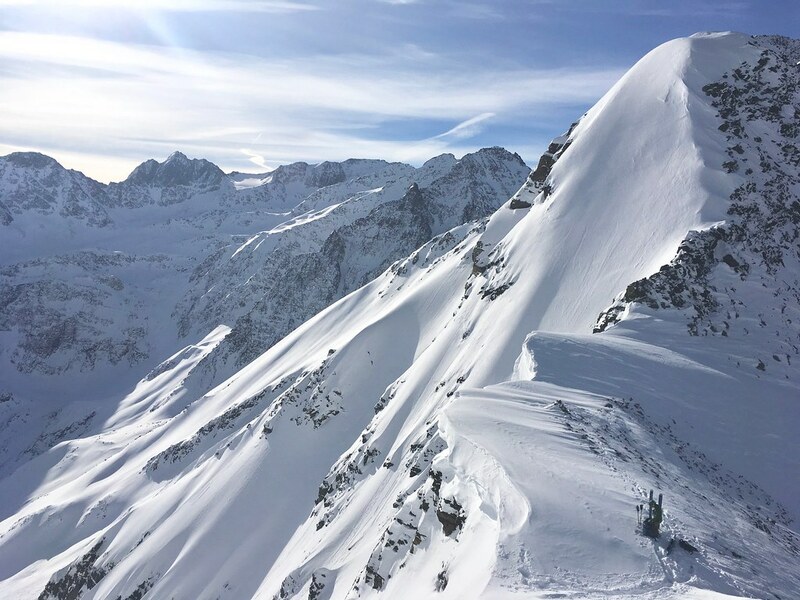 Most/all drivers just assume everyone in ski gear will have it and don't bother checking, but if you do get checked by a warden you could potentially get quite a hefty fine.